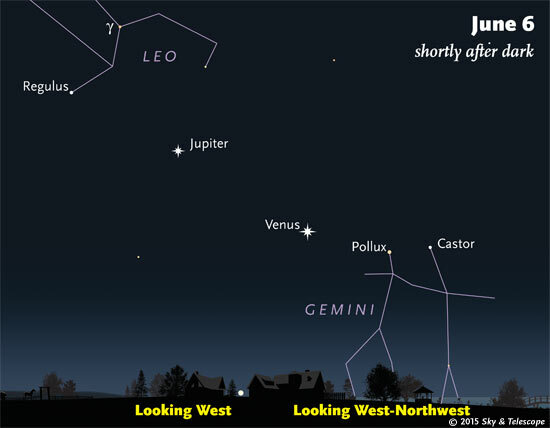 On your next clear night go outside after sunset and look in the west to find the two brightest planets in the sky - Venus and Jupiter. Venus is the brighter of the two and is to the right of Jupiter. As each day in June passes the two planets will get closer to one another and on June 30th will be less than a degree apart! That is CLOSE. Try taking a pic of the planetary pair using your cell phone camera or DSLR. It is best to wait until it is dark as the color and brightness of the two will be at their best. Taking a pic every few days and then comparing them will show their motion quite nicely. It is the movement of Venus, Jupiter AND our planet Earth that causes this motion as all 3 orbit the Sun. This is an event you will want to see.